This is a paid for review as part of BlogHer BookClub. snatching off the shelf anyhow is a very proud moment for me. Do you want to have more powerful interpersonal relationships? to make sense of your life? Do you want to live whole-hearted? Do you want to rid yourself from shame? Do you want to understand men and women better? Do you want to give your heart a hug? I thought I would do something different this time and give you a list of questions for this book review. This book is so jam-packed with the “hard stuff” that I don’t even want to dare pretend that I get it all. I will be reading it repeatedly until I have absorbed and memorized every nugget of wisdom. I wish every other person on the planet would do the same. It would seriously bring world peace and most certainly would give everyone inner peace. I’m not kidding, It’s that powerful. I was proud to be a part of this book campaign. I was thrilled. I mean I jumped up and down when I got the e-mail confirmation and cooked a fancy dinner for my family when it arrived in the mail. I have been pouring over its pages and sharing parts with my hubby every chance I get. I have compromised my facebook relationships with the overabundance of quotes from this book. I just can’t stop. It’s too totally amazing not to share. YOU HAVE TO READ THIS BOOK. If you don’t want to buy your own copy, borrow mine. I can’t share it though for at least another month until I have it memorized. World peace, people. World peace. 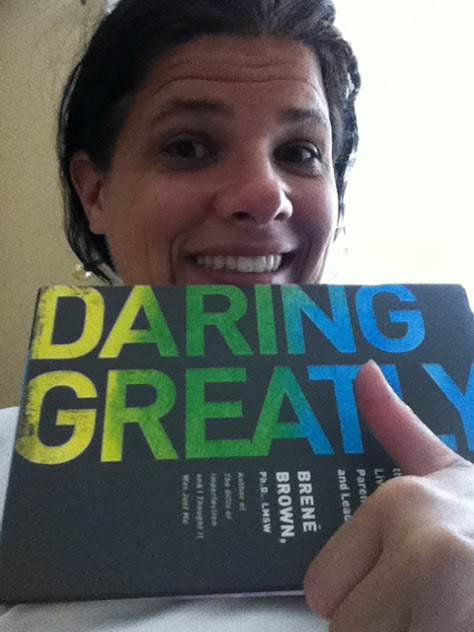 A huge thanks to marriage counselor friend John Morgan who turned me on to Brene Brown just months ago. He shared with me her talks from Ted. I was hooked. Brene is a researcher and has a PHD and LMSW. Her life’s work is shame and vulnerability. Here are her videos. Watch them both. Come back if you have to. They will make you understand why you need to read this book. Even if you aren’t into that psychological mumbo-jumbo, you need to be.